Clutch change, drive shaft stuck in hub. Once again i am having trouble with our beloved i30 1.4 gasoline 2008. This came as a shock as it has never shown any signs of bad gear shifting or anything like it. Happened on my way back from work, as it didn't accelerate if i went pass 2000-2200 rpm. Top speed is now 45-50 km/h. U feel it too as u shift gear. I got a dear friend of mine to fix the whole operation for just 1000 DKK (200 AUD, 158 USD). I did buy the clutch set myself. As we wanted to take the transmission off from underneath, we found out that because of the frame "bridge" or whatever you may call it (the big frame supporting all around the bottom of underneath the car engine). We weren't capable of doing so. We decided to lift the whole engine up instead, but after going through hell, we bumped into the drive shaft disassembling, but got stuck. We Just CAN'T get the drift shaft out of the wheel hub, tried to hammer carefully With piece of wood. Can People please share their knowledge about getting it off, and Best way to get transmission off? Re: Clutch change, drive shaft stuck in hub. So you're trying to get the splined shaft out of the hub? You've removed the split pin and 32mm nut and it's seized in the hub, correct? Tried penetrating oil yet? Can't say I've had a seized one in any of my FWD cars, maybe remove 6 shafts in total so not vast experience. Maybe disassemble the knuckle from the suspension and leave the hub on. Not ideal but possible. When I diassembled my wagon I removed the entire arms , hub and shaft but then I was transferring the entire assemblies. Just thinking about it , you may not have enough travel in the joint to compress the shaft to get the spline out anyway with undoing that knuckle. Pin and nut removed yes. I've also heard from many People that they were almost able to push it out with there fingers. Just really tricky to see it move at all. Both my mechanic and I were nervous about damaging Any other parts if we went on With hammmering. Hate the fact that i need to lend a tool to put pressure on it. I'd go with being able to push it out by hand, dunno something sounds wrong. You would think a mechanic could work it out. I'm fairly sure you won't get that shaft out without undoing the knuckle assembly. In fact reading the manual, says to , remove the caliper,rotor, disconnect the tie rod end,the ball joint and the knuckle off the strut. So if i get this right you need to remove engine from bay to replace the clutch. Tw2005: He is a former mechanic who helps people for an small amount of money heh. He did mention a special tool to mount on it, and then it applies pressure on the splined shaft. Until it pops out of the hub. What's the chances of a photo so we can get an eyeball of it? If you you disconnect the knuckle assembly, you should be able to then pry the inner joint out of the box, leave the shaft in the hub and move on if it's that jammed or that will allow the hub to be placed in a vice and then maybe get the shaft out. I Will try to fix a image for you, although the car is standing still at our parkinglot at the moment, cause we need to plan the time When we borrow the garage with lift. The Idea of disassambling the shaft, leaving the hub in sounds very smart. I'm not suggesting disassembly of the shaft, I think hat would make it an awful job. here's the concept, not the same hub but this whole assembly disconnected from the suspension for this is the part the shaft is stuck in, once disconnected then pry the inner joint from the box and carry the whole lot out. Turning the whole danish language into English can be a bit tricky. So you mean taking it out like this ? You should have had the car front off the ground. Wheels off and bottom nut going through each lower control arm removed. The hub assemblies can be pulled clear of the shaft. Then lightly lever the other end of the shaft out the gearbox. Suggest you push it back through, check for rust and dirt. apply WD40 and start again, as above. No worries, the picture is from Google. We did do all the steps, and got stuck at the part where we couldn't get the axle off the hub in "outer side"
I have been suggested to take out the engine from underneath, by leaving it on the "front subframe" and lift the car up. Yes that's how the car was assembled in the factory. Basically free the strut bolts ,brake lines, electrical connections; then the bolts on the SUB FRAME. Then lower it all. Is it possible that part of the split pin securing the shaft nut has remained and is jammed in the spline? I suggest you deal with it now, same problem will occur when you have it out as described above. adding to yesterdays comments, you are making needless work for yourself. Much simpler to just remove the gearbox. 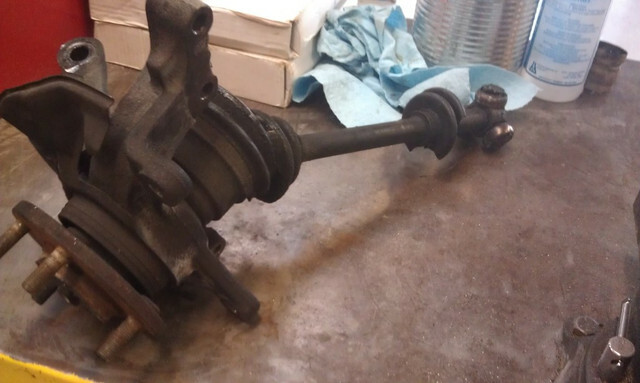 If you cant free the drive shaft, take the brake calliper and hub off as in your picture, but don't separate the shaft; just ease the whole driveshaft out of the gearbox intact. I am really trying to find the Best and easiest way. I will try again with getting the axle issue fixed. BTW the split pin was in very messed up condition. But could that be it, if a tiny piece Maybe is stuck? I usually remove the bonnet (4 bolts) > remove drive shafts.>support the motor with jack> unbolt gearbox etc> lift it out. Your subframe out method means dealing with connections electrical, brake, aircon, coolant, exhaust and steering. Would love to use your method, But it seems like the gearbox Will have trouble being lifted out because of the subframe blocking the Way down? NO lifting is UP> out the top> toward the sun> or the moon if you stop to eat . But Will it be possible to get it out of engine room by lifting it out from the top ? Check out this guide, which is Pretty detailed. I know mine is a 1.4 liter, But shouldnt it be much alike the 1.6 ? 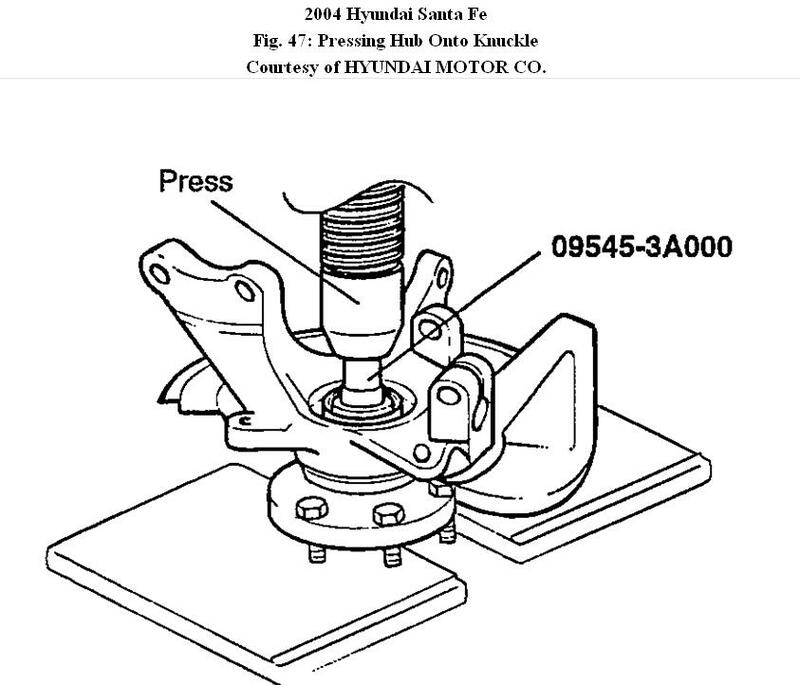 The manual does look like it doesnt have the sub frame to block the transaxle. Isn't there a good guide for i30 FD (2008) transaxle removal ? Wish the sub frame Didnt cause this much problems. The guide is giving you every nut and bolt to be removed. The sub frame will probably be in all models. There is enough room to lift the gear box UP and out of the engine bay. If you find the 'box out' process too difficult , then drop the sub frame. But that way motor and box come out intact plus steering and suspension; all still attached to the frame. You need to drop it all down and lift the car high enough to move body and power train apart. Frankly, its not rocket science. Try to knock the hub back onto the shaft and clean the spline. The choose an above method and start pulling parts off. PS take lots of photos before you start. Easier to find your way back. The car is at the parking lot conpletely assembled, so i am ready to begin soon. The only thing delaying me, is the fact that i need to lend the hydralic lift garage from a friend. At least if i use the subframe method. Otherwise i Could probably do it by lifting it up by a jack? And take it out from the top method. What would you personally prefer? As told, i Got my mechanic guy, who ain't a Hyundai expert (i know now). But he Will be helping me. Is this discussion going around in circles, or is it just me? Hopefully with all the advice given in this thread your mechanic friend should be good to go! 2013 Toyota Corolla Ascent Sport 6sp Manual. formerly 2009 i30 Hatch 5sp Manual. Meanwhile, I am taking refuge in Christchurch , despite the 6 degree temp and the sleet and the earth tremors, Its comforting, .